In the last several hundred years, human activity has shifted large quantities of the world's carbon from long-term storage (i.e. carbon bound up in rocks, fossil fuels, and forests) into forms of short-term storage such as croplands and pastures, which tend to store less carbon for shorter periods of time. Today, forests cover about 30 percent of the planet's surface, and are the largest terrestrial source of carbon on Earth. As much as 45% percent of the carbon stored on land is thought to be locked up in our forests, but precisely where the biggest carbon sinks are located — and how they interact with man-made, short term carbon stores — remains uncertain, and is an important area of scientific investigation. A rule of thumb for ecologists is that the amount of carbon stored in a tree equals 50 percent of its dry biomass. So if you can estimate the biomass of all the trees in all the forests, you can estimate how much carbon is being stored on land. Repeating those measurements over years, decades, and centuries would then help us understand how carbon is moving around the planet. By working with colleagues at the U.S. Forest Service and U.S. Geological Survey, researchers Josef Kellndorf and Wayne Walker spent six years assembling the national forest map you see up top [hi-res available here], using space-based radar, satellite sensors, computer models, and enormous quantities of ground-based data. The end result, according to NASA, is the most detailed view of forest structure and carbon storage assembled for any country in history. "Forests are a key element for human activity," explains Kellndorfer. "Resource managers need to see forests down to the disturbance resolution-the scale at which parking lots or developments or farms are carved out by deforestation. We have to know how much we have, and where, in order to conduct sound management and harvesting." Of course, the dynamics of global carbon distribution extend beyond the borders of the United States. 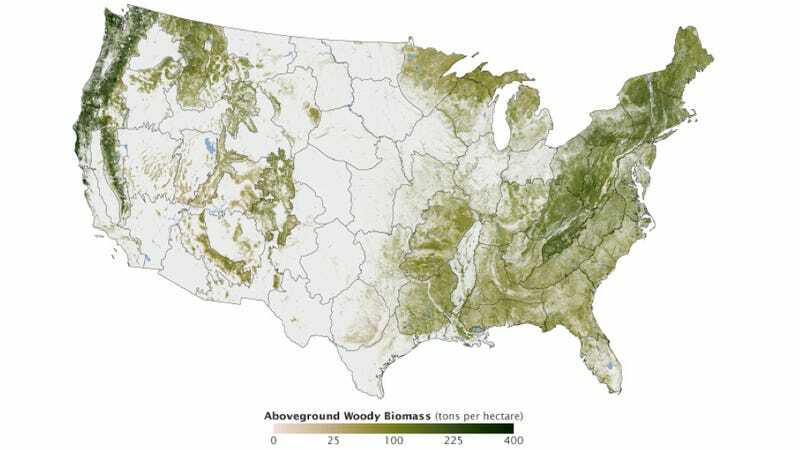 With any luck, high-resolution mapping of terrestrial biomass will soon be conducted for other regions of the world, as well. You can read more about the creation of the map over at NASA Earth Observatory.